We’re hosting an open-house to give the public a chance to see what we do, and to celebrate our second anniversary, and the expansion of our physical facilities, doubling the amount of space we occupied two years ago. Come out and see what we do, and perhaps learn a thing or two from our team. 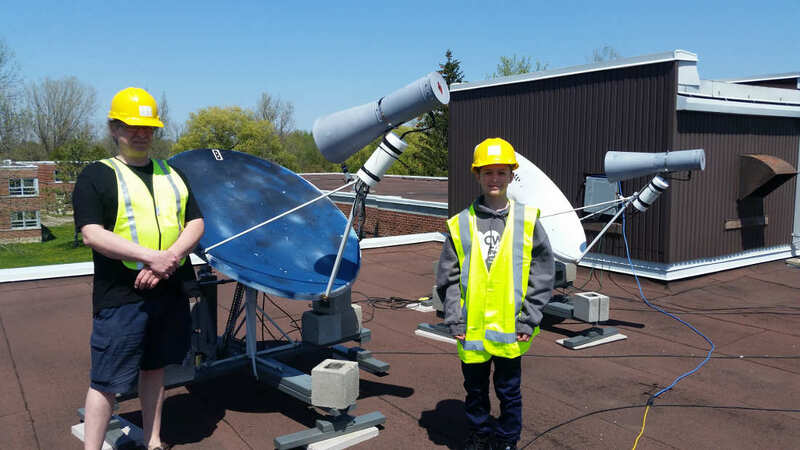 We have been busy the last few weeks building-up a mobile radio telescope in support of high-school physics programs. CCERA secured access to a number of small, very-high-quality microwave dishes, and we’re turning two of those into a mobile radio telescope that can be loaned to local high-schools for radio astronomy demonstrations and short-term observing programs. 12GHz or 2.8GHz, depending on the observing program. We’ve upgraded the back-end of the 21cm spectrometer, including both DSP software and the matching SDR hardware. The SDR receivers are now synchronized to a GPS-derived 10MHz reference clock, which provides an uncertainty in doppler measurements of approximately 30cm/sec. The FFT resolution has been improved, by covering only the +/- 200km/sec of doppler velocity that is “visible” within the galaxy. This provides a resolution in the FFT of approximately 0.26km/sec or approximately 0.1% of the peak velocity that we are able to observe within the galaxy. coming weeks. Stay tuned for updates. The first of two 1.2m dishes for rapid surveys of the 21cm line has been brought on-line, and is currently observing at the declination of the galactic center (declination of -29 degrees). The second dish will be brought on-line soon, which will allow spectral surveys do be completed at twice the rate of a single dish of the same size. Stay “tuned” for more announcements…. We’ve been waiting patiently for Cassiopeia A to move far enough away from the Sun (back towards nighttime) to make observations feasible. In the last few days, we’ve been able to capture very high-quality transits, as shown below. A donated 12ft Andrew Dish! John Blais, of Almonte, Ontario, very kindly donated a 12ft Andrew solid-aluminum dish to us. The long-term plan is to incorporate it into our pulsar work. We’ll make up a very-simple fixed-pointing mount, which will have the dish pointed nearly-vertical, with a 9 degree tilt to the North. We changed the declination of the interferometer antennae to point at +41, and got several good transits of Cygnus A (3C405), shown below. Our next target is Hercules A (3C348), at a declination of +5, currently transiting in the middle of the night for us, so no Sun problems. Using CCERA’s “insanely small array” radio telescope, we have successfully completed a 4-day “study” of the extragalactic radio source Virgo A. Show below are both the complex-correlator outputs, and the brightness derivation. Virgo A, also known as M87, is a massive galaxy some 54 million light-years from earth. It plays host to a super-massive black hole at the center, which produces a super-luminal (apparently-faster-than-light) gas “jet” of ejected material. Its radio flux at 611MHz (our observing frequency) is approximately 500 Jansky, or 5×10^-24 Watts/M^2/Hz of bandwidth. Since our antenna are roughly 1 M^2 in area, That means that we’re intercepting a few pico-watts of power from this source!